For centuries people used art as a way to express their feelings and improve their well-being. From a very young age, we instinctively use drawing, painting or modeling clay as a way to communicate, reduce stress and express emotions. But as adults, we often forget about the beneficial effects of art. Art therapy, conducted under the supervision of a skilled therapist is there to remind us that, apart from its ecstatically value, visual art is a valuable tool for preventing sickness, improving health and overall well-being. // What is Art Therapy? Art therapy is a therapeutic technique that uses different types of visual arts to improve the physical, mental and emotional well-being of a person. It was established in the mid-20th century as a specific therapeutic field when doctors noted that mentally ill patients sometimes prefer to express themselves visually. Since then, art has become an important part of the therapeutic process for many patients. Art therapy provides a safe place where patients can explore unpleasant feelings such as anger, sadness, or fear. Feelings that they are otherwise reluctant to talk about. Art therapy is used to treat numerous conditions in both young people and adults. It can help with learning disabilities, severe stress, domestic abuse trauma, depression, anxiety, and other psychological issues. It helps battle anxiety and depression by raising the levels of serotonin, while PTSD symptoms can be relieved by visually expressing the traumatic events that caused them. Art can also help improve memory and reasoning in older people. Researches have shown that drawing and painting can stimulate memories in people with dementia and other neurological diseases. Painting, drawing and other art forms can help increase the number of connections in the brain that impact memory, improve moods and expand a person’s vocabulary. Art therapy is even used in treating cancer as it helps decrease stress and perception of pain, improves quality of life and compliance to treatment. Experts usually make a distinction between two types of art therapy: art as therapy and art in therapy. The first approach focuses on the process of creating art rather than the final result. The process of drawing, paintings, sculpturing, and other artistic practices, can help calm people down and reduce stress and depression. The creative process is closely monitored by an art therapist who may ask the patient how they felt during drawing, painting, sculpting… and how it affected their lives. Art in therapy, on the other hand, focuses on the final result of the creative process. In this approach, a patient and a therapist work together to deciphers the deeper meaning of the artwork. Art in therapy can help convey something that’s difficult to express in words. By using crayons, clay and other art supplies, patients visually express their inside thoughts, evoke memories and reveal subconscious beliefs. This type of therapy is a great way to reduce trauma, treat posttraumatic stress disorder (PTSD), and similar conditions. But you don’t have to produce art to discover its healing power. Looking at art is beneficial for people’s health as well. There’s an increasing number of studies that imply that surrounding yourself with art is an effective way of preventing and treating a variety of conditions. 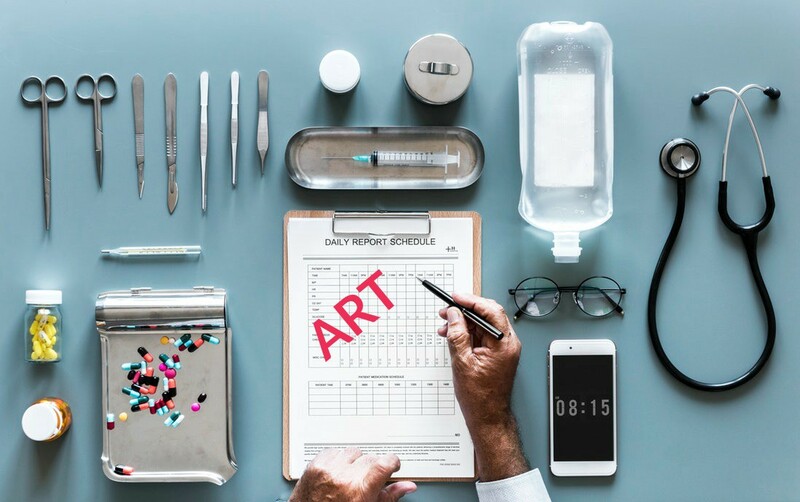 Recently, Canada became the first country that allowed doctors to “prescribe art” to their patients. A ground-breaking project initiated by Montreal physician organization and the Montreal Museum of Fine arts allows physicians to prescribe free museum visits to patients. The project that started on November 1st, 2018 is meant to tackle a variety of conditions ranging from depression and anxiety to eating disorders and high blood pressure and will be used alongside regular medical treatments. // How Can Looking at Art Improve Patient’s Health? Museum visits help reduce stress in people by taking them away from the busyness of modern-day life and by immersing them into a more tranquil environment. In a conversation with Montreal Gazette Canada’s doctor, Helene Boyer explained how museum visits “increase our level of cortisol and our level of serotonin. Hormones that are responsible for human well-being”. Similar to daily exercise, surrounding yourself with art can help balance these hormones, responsible for a variety of diseases including depression, anxiety but also diabetes and high blood pressure. And all this without heavy medications or worrying about side effects. Also, visiting museums and galleries means surrounding yourself with other people, which will help patients suffering from illnesses related to loneliness. But the positive effects of art therapy are not limited to people with illness only. Even perfectly healthy people can benefit a lot from art. Art therapy reduces stress by keeping the patients’ mind of the things that are troubling them, and by shifting the focus to the enjoyable process of creating art. Also, studies have shown that even the fact that you took the time to do something for yourself, (whether it’s painting on canvas or visiting a museum) can lead to improved self-awareness and self-esteem. With so many positive effects on people’s health, it’s no wonder that art therapy is being increasingly used in hospitals, schools, rehab facilities, and senior centers. By giving people a way to express their problems, and an escape to a happier, serene reality, art therapy is a powerful weapon in preventing and battling illness and improving one’s well-being.